Is your competitors' online presence more current and user friendly than yours? - The web has truly revolutionized the way we access information, the way we shop, and the way we conduct business overall. While it is critical to have an online presence, the responsibility of your organization goes beyond that. This Internet revolution is accompanied by its own set of rules that govern and influence the credibility and quality of your online presence, and this perception extends to your company itself. 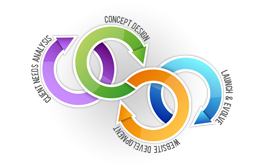 - At ITIS, we have more than a decade of experience designing websites for a range of industries. Our team instinctively understands how to make a website attractive, engaging and capable of holding the customer’s interest. This ability to induce websites with the x-factor is balanced with the technical capabilities of ensuring usability, ease of navigation and intuitive functionality. We design websites that result in more visibility, more business and more profitability. - Additionally, we make sure that any web development we undertake for our clients is search engine friendly, as this enables them to get maximum returns for their investment. Establish a quality and integrated web presence. Improve brand awareness and perception. Enhance the user experience and user satisfaction. Open up an online sales and marketing channel. Directly influence your bottom line.